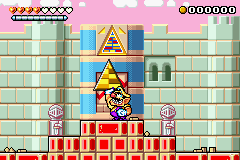 Toy Block Tower is the first level of the Topaz Passage in the Game Boy Advance game Wario Land 4. The Toy Block Tower is a toy block themed stage. This stage has a few items that can only be found in the tower such as the Rolling Toy Block and the Triangle Toy Block. The Rolling Block is used as a mobile platform which Wario can move by ramming, and the Triangle Toy Block is used as a key to open the Toy Block Door. This is the only level that features the Pig Head Statue, which spits fire and transforms Wario into Flaming Wario, where he can then destroy Bonfire Blocks. This level's CD is called So Sleepy and once collected, it can be played in the Sound Room. This page was last edited on April 23, 2019, at 08:43.